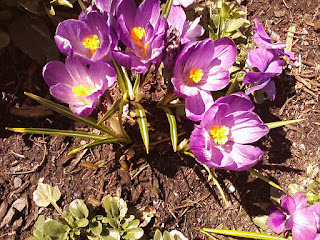 Doll's Musings: Spring Has Sprung!! This is just a quick post to let you all know that I am still here!! I've been extremely busy again. Working everyday, church all weekend, then back to work all next week. Next weekend I will have a bit more time to do a better post and some stitching, which I've been missing like crazy!!! I have added a few stitches in Jane here and there but nothing worthy enough to post about. So here are some photos I took of the one day of sunshine we had last weekend. Yup, it's been raining all week and this weekend is not looking much better. But, I do see the cherry blossoms are starting to come out and the magnolia blossom buds are getting ready to open!! So excited for that to happen!!! I'll take some photos of my Nana's magnolia trees to share with you all!! Also, my mom is in the city and I'm so happy to have her here. I want her to come over and help me with some of my sewing projects and have a nice visit with me! Lent is also coming to an end in a couple of weeks and I'm looking forward to having cream in my coffee again!!! I can't wait!!! This photo I think was taken about two years ago but it's one of my favourites of my mom and me! LOVE YOU MOM!!! Oooh, Titus is trying to jump up onto my stitching/sewing desk!! He's being so naughty lately really getting into my stitching!!! Here's a photo of my disorganized desk. OOOH! He did it while I was typing this! I think my big "OFF" voice scared him away!! What a little monkey!! So that's my disorganized, cluttered area! There is really no other place for anything. 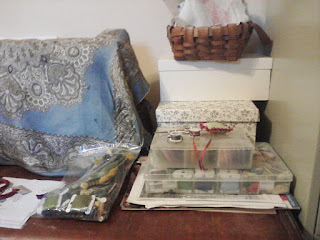 The drawers in the desk is full of other stuff not related to stitching. We have storage issues in this apartment!! Anywho, just thought I would share that with you since I have no stitching photos to share!! 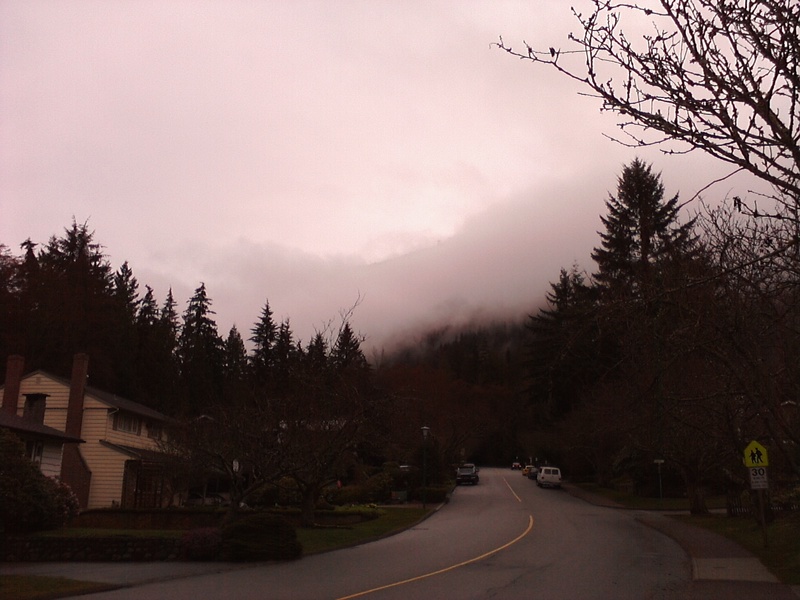 Love the mist that is down coming from the mountain tops at the school I have been working at all week! Isn't it majestic?! I miss reading/commenting on all of your blogs and was starting to try and work through the massive numbers in google reader this morning, but now it's already 11:00 am and I still need to get ready to go uptown and get some more dark chocolate to make those vegan cookies for church. Really what I want to do all day is stitch!!! My fingers are itching to stitch!!!! I spy loads of lovely posts and stitching and wonderful photos and I'm looking forward to spending some quality time enjoying all of your posts, even if it's weeks late!!! I really miss all of you!!!!!!!!!!!!!!!!!!!!!!! Welcome to my new followers!! Enjoy having your mom around. Lovely pics too -- your part of the world is so pretty. One of these days I want to visit that area. Dark chocolate -- yum! 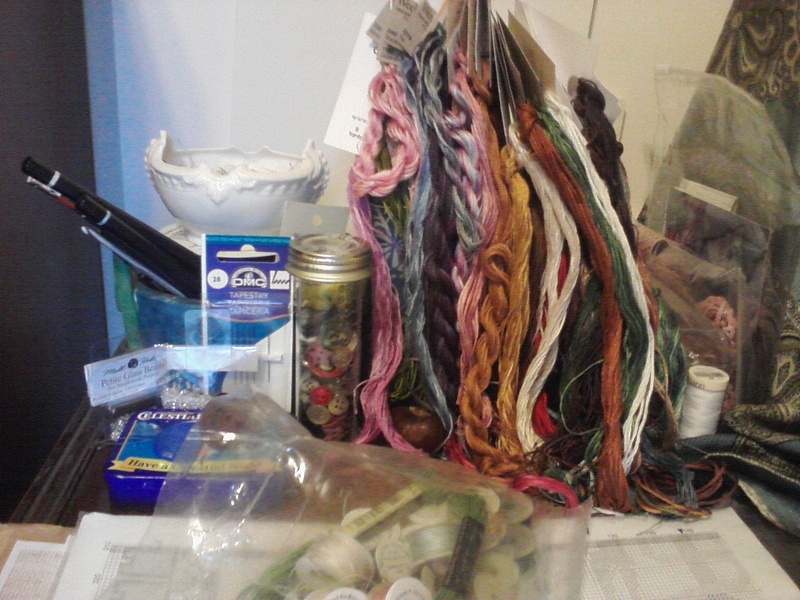 Hope things slow down soon so you can stitch some more. Want to see more of Jane! Hope you have a wonderful time with your mom! 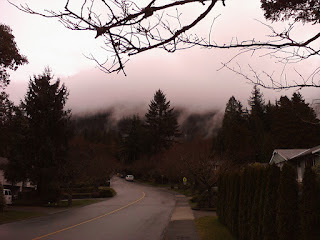 Loved all the pics ~ the mist pics are so pretty! And a very sweet pic of you and your mom! The mist does look really cool, Anne. Sorry you haven't had any stitchy time lately. I hope you get some soon. Love the pic of you and your mom. It's wonderful. And lovely flowers you have there. Are those at home? Don't worry, you'll get back to your stitching and it will be heavenly. And one of my favorite things about where I live (and where Boyfriend lives, too) is watching the mist come over the mountains. It's glorious. 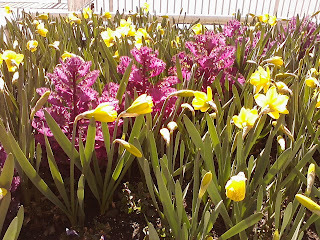 Beautiful flowers and great photos. 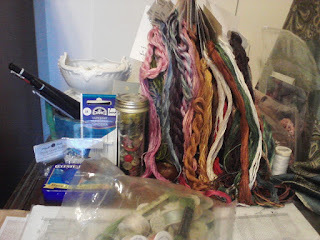 Hope you get some stitchy time soon hugs. Great pictures - thank you for sharing. I laugh when I read your post as you are so full of enthusiasm and energy! I bet the kiddies love you at school. That's a lovely photo of you & your mom. You look like her a lot! Have fun spending your time with her and your finishing "lessons"! Oh, that Titus. Yeah, my cats would do that. However, I restrict my work to a room with a door which I can close so they can't get in when I'm not around! As to storage, I have made friends with many IKEA storage boxes! Looking forward to seeing you next Friday. I'll email you as we get closer to that date! Annie.... you look JUST like your mom!! I love that pic of you guys too. Give her a huge hug from me. Make sure you tell her I'm not a stalker. HAHAHAHA!!!!! Enjoy your spring, Anne--it certainly looks like a lovely spot there in B.C. The photograph of you and your mum is very wonderful! Pretty crocus! The foggy photograph is magnificent. Enjoy having some time with your mum. Great pics...especially the one of you and your mom, that's so sweet! 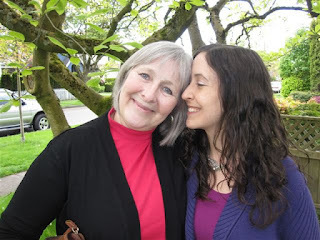 I love the sweet photo of you and your beautiful Mother:) I know just how you must feel about not being able to post or visit with your dear sttchy/blogger friends. Where do the days go so quickly? Lovely photos of the beautiful crocuses and the mist coming down from the mountains! Life does get busy sometimes, but we always comenoutnat the other end. What a fantastic picture of you and your Mom! I love all your pics but the one of you and your Mom is fabulous! I'm glad you enjoyed her visit. Traveling Pattern - Thankful for Ewe!